How do cookies work in cross domain tracking? Once we verify the metrics are getting captured correctly, we’re all good.!! Google tag manager really speeds up the implementation work as compared to analytics.js manual placement. We’ll look at step by step implementation of Cross Domain Tracking for subdomains & 3rdparty domains. Well there’s not much to add here because it’s just a one step setup. In fields to set > Field Name, add cookieDomain to ‘auto’. Here’s a scenario just to understand what happens exactly. User lands on www.my-A-site.com for first time. The analytics code stores a cookie on my-A-site.com. When the user goes to shop.my-A-site.com, the analytics code there reads the cookie stored by my-A-site.com & recognises the same user using clientID. Now if you have sites like www.Asite.com & www.Bsite.com we have a problem here. The cookies (clientID) stored by Asite.com cannot be read by Bsite.com due to same-origin policy. These clientIDs would then be fetched by destination.com. Step 1 : Create variables in Google Tag Manager. Decorate Forms (optional) : If you have a form which migrates the user to other site, on submitting. Set it True. Step 2 : Create Universal analytics tag & use the cross domain setting variable. Create a new Analytics tag & use the Analytics Settings Variable you saved in previous step. In Google Analytics > Property Settings > Tracking Info > Referral Exclusion List > Add all the Source & Destination Domain. Here’s a scenario just to understand what happens. When the user clicks on the link to goes to www.my-B-site.com, he lands on www.my-B-site.com/?_ga=xxxxxxx.xxxxxxxxxx. The analytics code on www.my-B-site.com reads the clientID from the URL & uses it. This results in User being counted as same thoughout all the domains. We’ll start with step by step verification of cross domain tracking. Also, the clientID on source.com should match the clientID on destination.com You can use network tab in browser debugger. Filter the requests by ‘collect’ to get hit data sent to analytics. cid & tid must be same for both the domains for a single user. Query paramters are stripped off on destination domain as soon as user lands. If you want to have page path in analytics UI as Hostname+pagepath, then you can use advanced view filters. check below settings. Hi! usefull post! if i have for example A.com, A.it, A.pt… are considered as a diferent domains? Yes. The cookie stored at ‘A.com’ is not available for ‘A.it’ . 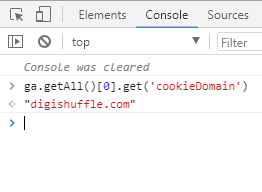 You can check the ga cookie domain by opening the console. (Ctrl+Shift+I) & pasting ga.getAll().get(‘cookieDomain’).